Allowing for lots of creative free play and gift-giving that comes from the heart, handmade gifts get at the heart of the season! Families can engage in DIY projects at home, attend upcoming workshops, or utilize resources offered by local arts organizations to craft handmade gifts with love. The holidays are upon us, and with the approach of a season of light, kindness, and appreciation of one another comes the need for giving – the sharing of gifts of all sizes serving as representation for our love and gratitude for each other. With the holidays comes an onslaught of commercialism, encouraging us to buy gifts rather than create them with love. In order to celebrate a non-commercial holiday season, families can commit to sharing appreciation for others during the holiday season by making handmade items for loved ones. 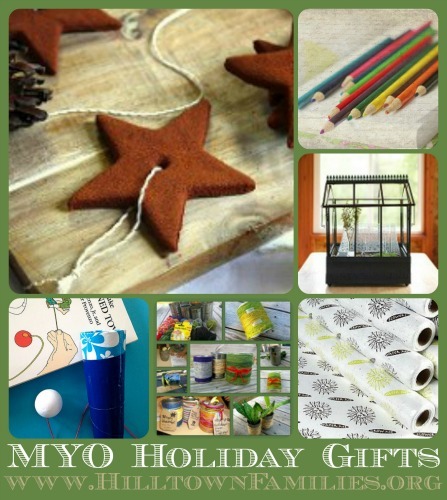 Handmade gifts not only reflect the emotions behind them, but allow young creators to engage in creative free play, and provide an alternative to consumption by creating opportunities for creative reuse of items! Does your family love to make and share art? Join ATCs for All in order to be part of an online community of artists, the purpose of which is to inspire creativity, and to collect and share artwork! Families can learn about the many different forms that art can take, while experimenting with new materials and connecting with other creative folks! Following in the wake of Hilltown Families’ Annual Handmade Valentine Swap, the creative, collaborative, and community-building possibilities offered by ATCs for All share a common thread with Hilltown Families’ annual swap – the purpose of the organization is to make and share art with willing, eager, and inspired participants everywhere! 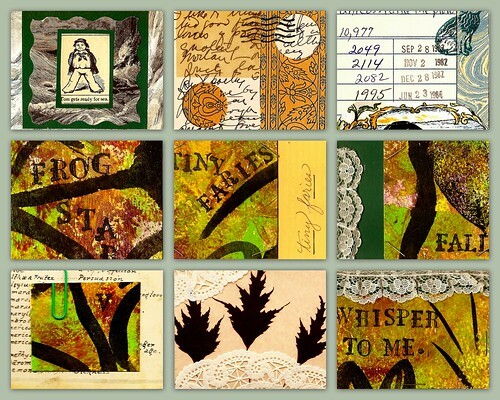 ATCs for All (the ATCs being short for Artist Trading Cards) is a community-run group that utilizes a website in order to facilitate art sharing of all kinds! New Year’s Resolution… To Enjoy Life! This New Year, rather than making a resolution to change something, why not make a commitment to find deeper appreciation for wonderful moments and shared time with friends and family? Throughout the year, write little notes of appreciation and deposit them into a memory bank to open up next year on New Year’s Day. Along with the first of the year comes the annual onslaught of New Year’s resolutions – pledges to ourselves to be more organized, read to our children more often, spend more time outside, and eat more healthy food. In theory, the resolutions are meant to help us change ourselves for the better and become more satisfied with our lives. However, resolutions can also be challenging, especially for families. Often, we set our sights on doing more, more, more – which is challenging and may not always be realistic. During a time of year when mass produced, environmentally unfriendly, and personality-free items are consumed more than ever, it’s incredibly refreshing to keep things not only handmade but simple! This becomes especially important once kids are involved, due to the unique combination of immense creativity and short attention span that the youngest of us often have. When Hilltown Families asked Knack: The Art of Clever Reuse to come up with a creative (and decorative) way to help families plant Paperwhite bulbs donated by Hadley Garden Center at the first ever Hilltown Families’ Family Community Service Night, we put our clever minds to work. Our goal was to have an activity that was easy enough for people of all ages, and messy wasn’t an option. Families would be traveling with their Community Passports to help out at a total of five volunteer stations, so we wanted to keep things simple yet creative. 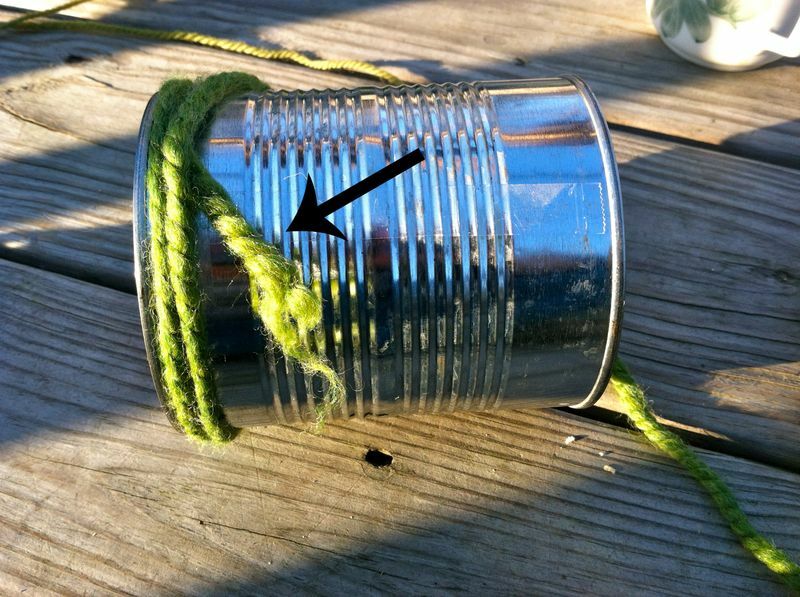 Our solution was yarn wrapped tin can planters… and it turned out to be quite a success! 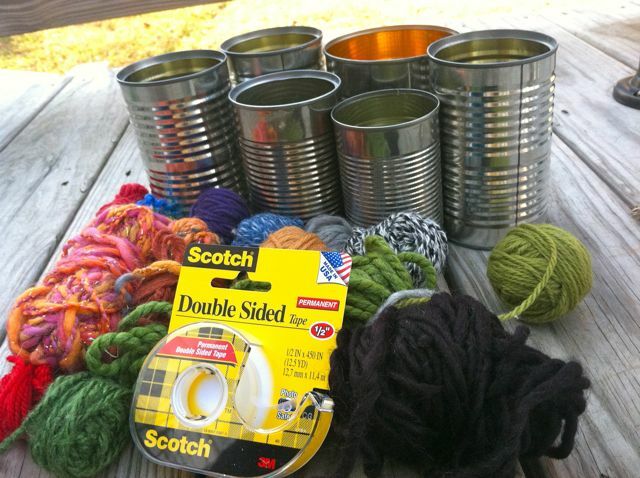 Yarn wrapping tin cans is the perfect small group activity. After decorating the cans, families filled them with one-third gravel, set a Narcissus papyraceus bulb on top, and attached an eco-friendly gift tag & care instructions. Families got to take home lovely decorated tin can planters to donate to a community center or give to a person of their choice. Everyone really loved the activity and Macey and I enjoyed facilitating the Winter Blossom Station, answering questions and seeing all of the colorfully wrapped cans that went home with participating families. 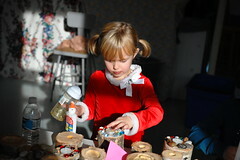 If you don’t have any bulbs to plant, you could also make cans to be used as an organizer for the…kitchen (chopsticks)…office (pens, pencils)…kids’ creative space (crayons, markers)…craft space (buttons, corks, glue sticks, paint chips)….share any other thoughts or comments you may have below. 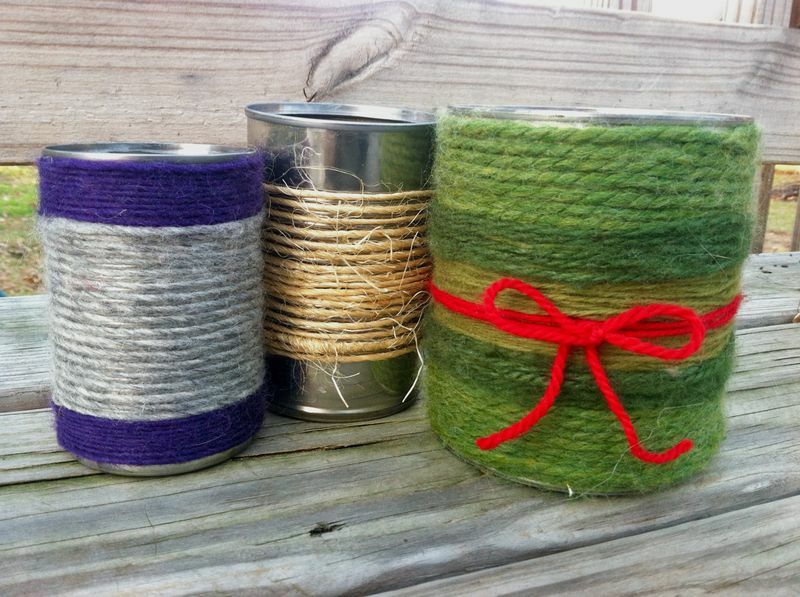 Also, you don’t have to stick with yarn– try fabric scraps, twine, or ribbon! Here are the instructions, so you can do-it-yourself (DIY) or with your friends, family, or classroom. Enjoy! 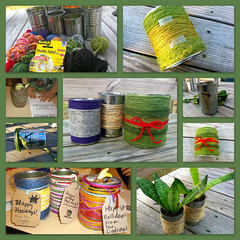 Gather your materials: Clean & Empty Tin Cans; Yarn/Twine; Scissors; Double-Sided Tape; Gift Tags (optional). 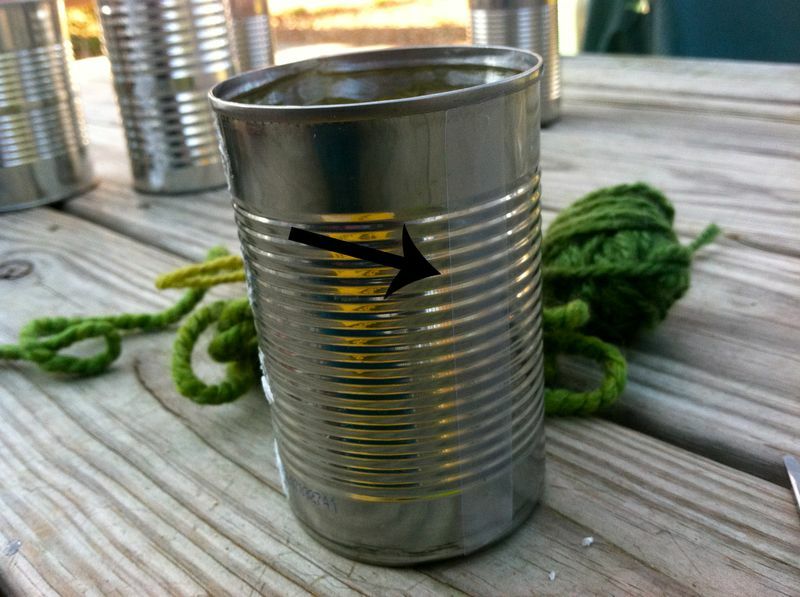 Step 1: Place a strip of double-sided tape on opposite sides of can. Length should be determined by the area you would like to wrap in yarn. 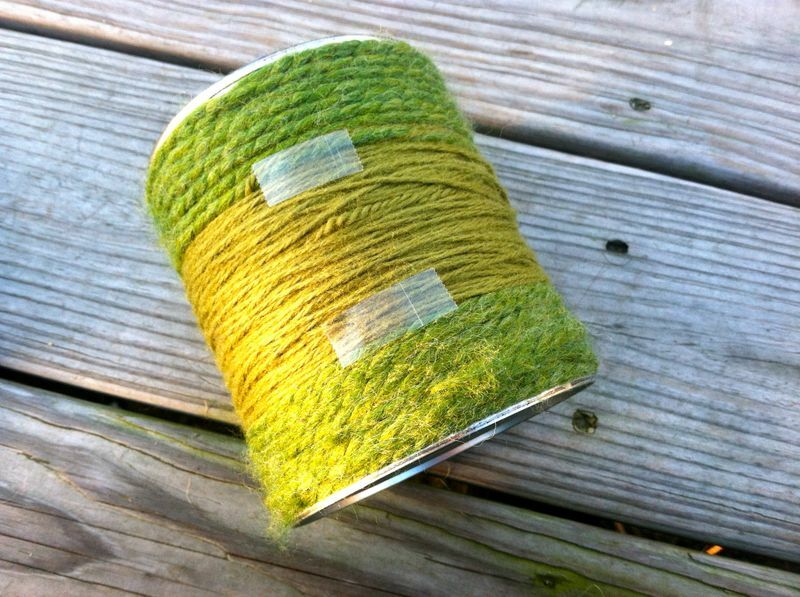 Step 3 (optional): If you would like to layer a second color or variation of yarn, place a few small strips of the double-sided tape on top of the yarn where you want to wrap your second layer (see photo) and then wrap the new color of yarn. Tie a bow and have a festive planter to plant in and give to brighten someone’s day! Here are other examples. 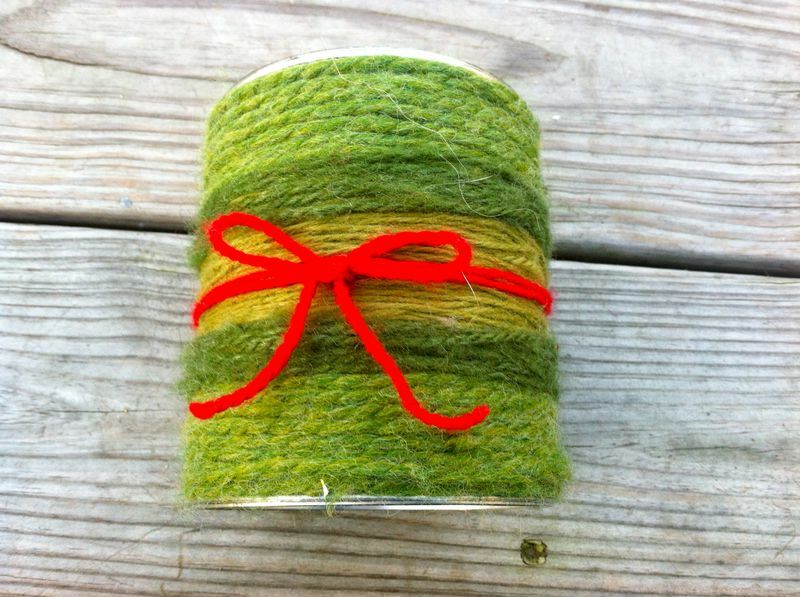 Wrap just the center with a natural color twine, or use a combination of colored yarn and cover the entire can. Go a step further and use a hot glue gun to adhere shells or buttons to the yarn! Add gravel, Paperwhite bulb and water. Tie on a gift tag and donate your planter to a community space (ex: library, post office, town hall) or give to a person of your choice (ex: elder in your life/neighborhood, teacher, receptionist at the children’s hospital). 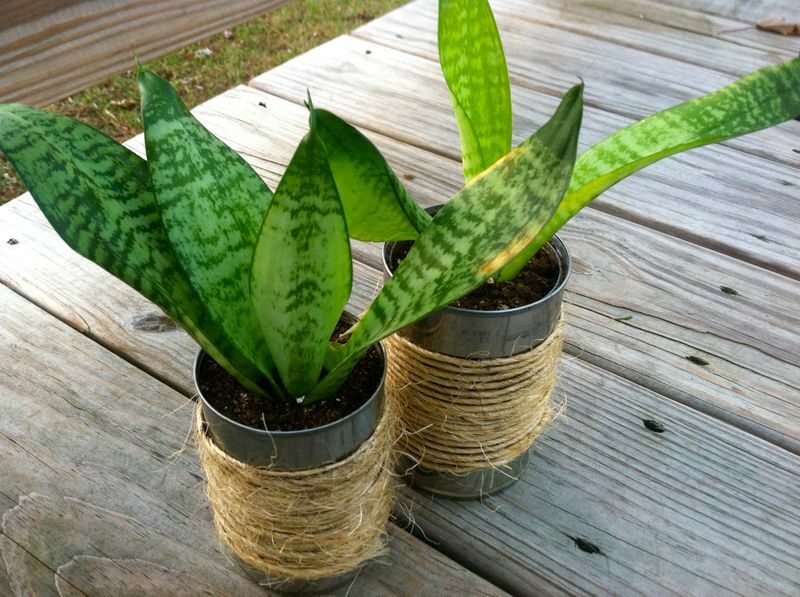 Need a home for your household plants? These make great containers! *Be careful when handling can, edges may be sharp. It is helpful to grind down the inside rim with a grinding stone or dremel, or you can pinch the rim with needle-nose pliers, or cover it with duct tape. Adults should handle removing sharp edges before giving the can to a small child. Older children should be reminded not to stick their hand in the can to prevent getting cut. Amber Ladley – Amber enjoys creating everything from food, to crafts, to websites. She is a mom of two young boys, Jack and William, who are currently being homeschooled by her husband, Tim. Amber and her friend, Macey, are co-founders of Knack: The Art of Clever Reuse, a new socially responsible for-profit business on a mission to open a creative reuse center for the Pioneer Valley. With classroom rosters in hand, several hilltown families set to work on making Valentines during a Hilltown Families Valentine Making Social on Sunday, Feb. 11, 2007. Families from Ashfield, Chesterfield, Cummington, Plainfield, and West Chesterfield gathered together with red and pink construction paper, glitter glue, white doilies and an assortment of stickers to set forth on the venture of making Valentines for friends, family and classmates. 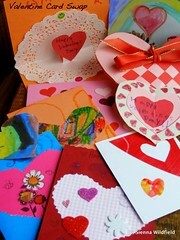 Making 20 Valentines can seem daunting. Making nearly 50 seems unreasonable. But when you have two children in school, that’s what the tally can add up to. Never mind having more than two children attending the same school! Some might say, “That’s what Hallmark’s for,” but we’re talking about hilltown families – motivated, creative and expressive folks who take on the task of Valentines with excitement and enthusiasm, letting the glitter fly! Preceding the cutting, glueing and glittering, children were shown a five-minute video which demonstrated how construction paper was made. Narrated by Fred Rogers, children took a video tour through a construction paper factory, illustrating how red construction paper is made – from log to shrink wrapped product. This video tour can be found as an extra feature on the DVD Mr. Rogers’ Neighborhood: What Do You Do with the Mad That You Feel? As the Valentine social progressed, and the kids finished their little love-notes, running off to play, the parents settled into their own projects and conversations. Over discussions on education, winter sports and safety, parents made heart-shaped mobiles, steamers of doilies and Swedish Paper Hearts. And when the kids tummies started to rumble, muffins donated by Bread Euphoria were served with tea and fruit. Weaving Swedish Paper Hearts can seem difficult at first, but once a rhythm is discovered, it is a pleasant activity to unwind with while relaxing with friends and community. These paper hearts were traditionally made as ornaments filled with goodies that went on the Christmas Tree, but they also make a wonderful Valentine’s craft. 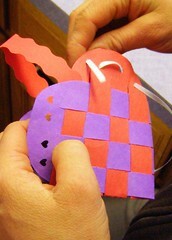 Learn how to make Swedish Paper Hearts for your loved ones. As an alternative to traditional holiday buying, the Hilltown Cooperative Charter Public School will host a family book and eco-craftmaking fair on Saturday December 4th, 2010 from 10 am to 4 pm at the “Brassworks” building on Rte. 9 (132 Main St.) in Haydenville, MA. Parents and children alike will have the opportunity to make a variety of craft items, many using recycled and natural materials including full-sized wreaths, fabric gift bags, felt key chains, gnomes and fairies, decorated candles, lavender sachets and gingerbread people. Concurrently with the crafts, new books from Scholastic will be showcased featuring the best of children’s literature, with hundreds of award-winning and other popular titles on display. The fair will also feature crafts from local craftspeople and a raffle. Free entrance into the fair. Small fee for craft making.All proceeds will be used to support the school library and other educational programs. The fair will also feature entertainment throughout the day, including the Hilltown School chorus. Home made lunches and baked goods will be available. The Hilltown Cooperative Charter Public School is a public school serving grades K-8 and emphasizing mixed-aged classrooms and an arts-integrated approach to curricula. There is no tuition; admission is by lottery and is open to students throughout Hampshire and Franklin counties. For more information about the fair, contact Deirdre Arthen at (413) 268-3421. 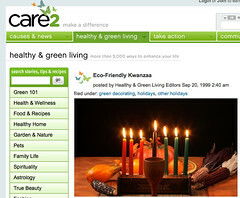 This site considers “the connection between Hanukkah [Festival of Lights], energy use, and the environment,” and provides “holiday tips and resources for families, schools, and congregations to infuse Hanukkah celebrations with additional meaning,” and “tips for what you can do save energy in your congregation/school and at home.” Includes a “CFL installation ceremony,” an essay about the meaning of the darkness of winter, and more. 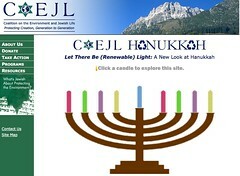 From the Coalition on the Environment and Jewish Life (COEJL). Collection of children’s craft activities for Christmas, Hanukkah, Kwanzaa, and New Year’s Eve that “give a gift to Mother Earth … [by turning] holiday and household surplus into festive decorations and eco-friendly packaging.” Includes instructions for a bubble packaging advent calendar, new uses for old greeting cards, fabric wrapping (inspired by Japanese furoshiki), and more. From FamilyFun magazine. 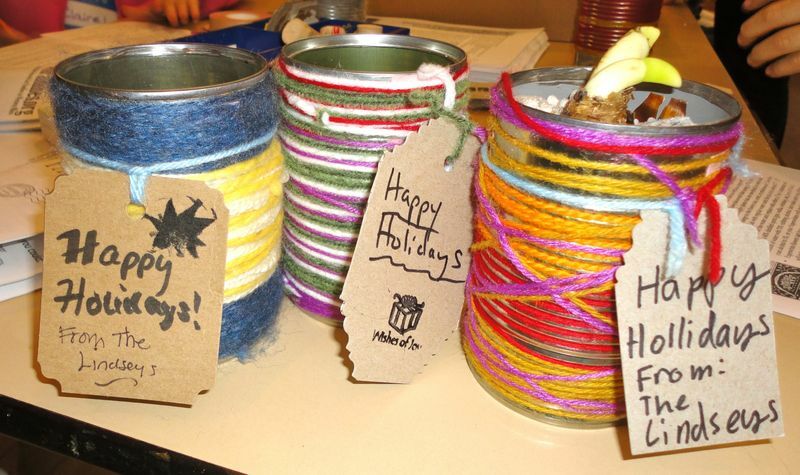 Craft ideas for making your own Kwanzaa celebration supplies. 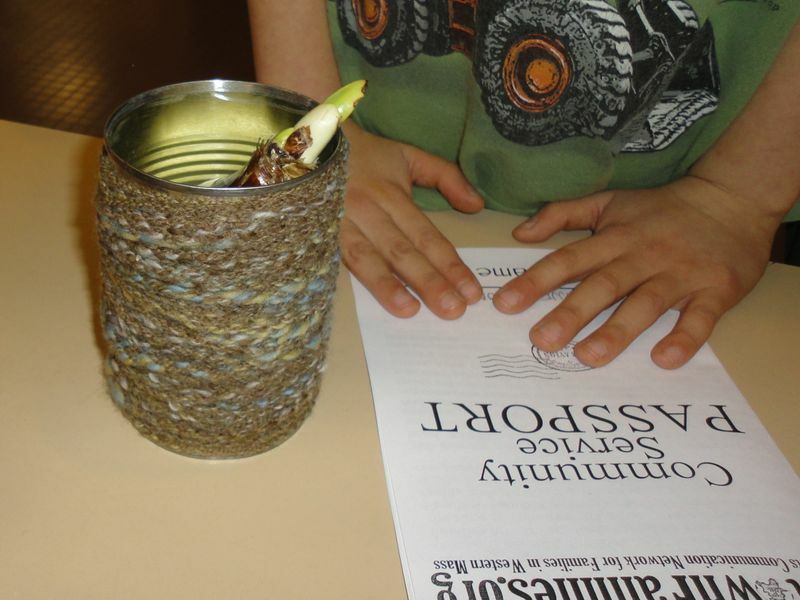 Includes instructions for making a Kwanzaa candle holder and mat. Also describes how to create other Kwanzaa symbols. From Care2, an activist organization. Hanukkah Music for Kids: Celebrate the Festival of Lights with Music! With a table laden with turkey, gravy, stuffing, and pumpkin pie, it’s easy to come up with reasons to give thanks this holiday season. But Thanksgiving is a great excuse to pause and give thanks for more than what’s sitting on the table. This activity gives kids a chance to make a cute collage of things that make them happy, and it’s perfect décor for holiday dinnertime, or any day of the year! 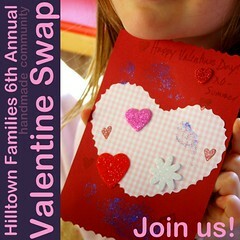 As an alternative to traditional holiday buying, the Hilltown Cooperative Charter Public School will host a family book and eco-craftmaking fair on Saturday December 5, 2009 from 10 am to 4 pm at the “Brassworks” building on Rte. 9 (132 Main St.) in Haydenville, MA. Parents and children alike will have the opportunity to make a variety of craft items, many using recycled and natural materials including full-sized wreaths, fabric gift bags, felt key chains, gnomes and fairies, decorated candles, lavender sachets and gingerbread people. 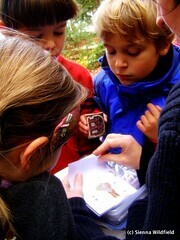 Letterboxing involves a mixture of artistry, adventure, navigation, and secrecy. All in all, it’s a great big treasure hunt with art lying in wait where the “X” marks the spot. It’s very similar to geocaching, except with clues instead of coordinates, and when found, a letterbox contains a tiny piece of one of a kind art – a hand carved stamp. Mix stamp making and treasure hunting in the great outdoors and you’ve got yourself a fun and creative pastime. Legend suggests that letterboxing began in 1854 when calling cards were placed in jars found outdoors. Upon finding a jar, others were encouraged to leave their card as well. Modern letterboxing follows the same guidelines using hand carved stamps and the World Wide Web. 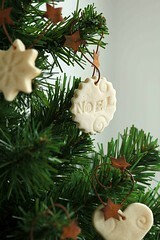 Step One: To begin, you’ll need to carve your own signature stamp. You can always use a pre-made stamp that you’re especially fond of, but many find it fulfilling to carve their own mark. Using Speedball tools and an eraser or some carving rubber, create the image you would like to represent your trail ID. You can also use this great tutorial on stamp carving. Step Two: Use the Internet to find some clues! Folks who create letterboxes publish the steps it takes to find them online. It’s hard to go on a treasure hunt without the map. You’d be surprised where letterboxes are located, since even the smallest of towns can have hidden boxes. You may have even discovered one while hiking in the past and didn’t quite know what it was. To start finding letterboxes close to you, check out www.letterboxing.org. Step Three: Some letterbox hunts will take all afternoon while others only fifteen minutes. Choose a set of clues that suits your schedule for the day, and your hunting style. Some clues are posted in poem form while others cut right to the chase and tell you how many steps to take and in what direction. It all depends on what you’re in the mood for. You can find letterboxes in state parks, campgrounds and even graveyards. Either way it’s rewarding when you find your way to the end of the hunt. Picture yourself nearing the end of your journey. You might read something like, “Take ten paces to your right” “Look for the tree with the double trunk” or “Dig into the ‘V’ of the tree until you find the box.” Woo hoo! You’ve found a letterbox! Inside you should find a logbook, a carved stamp, and some ink. Here’s your chance to make your creative mark in the world. Open up the logbook to a clean page and use your own stamp to leave your mark. Write a few notes about your trip and what you saw while hiking and sign your name. If you’d like to you can even write the date and where you’re from. It’s especially interesting for others to discover leaf though the log book and read other entries. Some books take you years into the past! You’ll also want to make a record of finding this letterbox for yourself. Take the stamp provided inside the letterbox and stamp it into your own logbook. 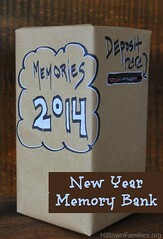 Jot down a few notes about your travels and remember to record the date and location of the box. These extra anecdotes are a great way to remember a trip away from home, as letterboxes are generally hidden in state parks or forests that represent the natural identity of an area. There’s a HUGE letterboxing world out there! Interested in finding “hitchhikers” “microboxes” and “mystery boxes?” Learn more about lingo and letterboxing etiquette at www.atlasquest.com. 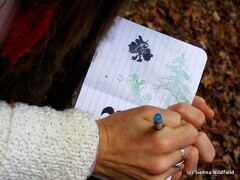 Letterboxing combines your creative abilities along with the fun of active exercise and adventure in the great outdoors. Once you get started with this addictive activity, you’ll soon find yourself with a logbook full of recordings of great hunts and hikes—as well as full of great memories. You’ll want to look back over your findings and compare what you’ve recorded with others as well. Originally published in Handmade News. Reprinted with Permission. This basket is simple to make and as cute as they come. Children as young as three can help and most six or seven-year-olds can make it themselves. Find out how at Celebrate Green. As an alternative to traditional holiday buying, the Hilltown Cooperative Charter Public School will host their annual family book and “green” craft fair on Saturday December 6, 2008 from 10 am to 4 pm at the “Brassworks” building on Rte. 9 (132 Main St.) in Williamsburg. Parents and children alike will have the opportunity to make a variety of eco-friendly craft items using mainly recycled and natural materials including full-sized wreaths, fabric gift bags, piggy banks, jewelry, vases, candle-holders, and cookbooks. Concurrently with the crafts, new books from Scholastic will be showcased featuring the best of children’s literature, with hundreds of award-winning and other popular titles on display. The fair will also feature crafts from local craftspeople and a raffle. All proceeds will be used to support the school library and other educational programs. Every year I send my parents a gingerbread house for their solstice dessert party, complete with their last name iced on the front door. The door with their name is left for the host and hostess, but by the end of the evening, their guests have demolished the rest of the house, leaving behind little red hots and coconut snow. It’s become a fun tradition. 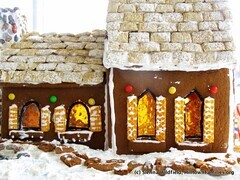 If you’re looking to make a gingerbread house for the holidays, check out A Charming Candy Cottage over at epicurious.com where Kari von Wening, the owner of Takes the Cake Bakery in Pasadena, CA, gives instruction on how to make your very own. Included in the instructions are a shopping list, template and an illustrated tutorial. At the Hartsbrook Winter Fair in Hadley, MA, they always have an auction of gingerbread houses (and libraries, castles, churches, windmills …) that the families have made (photos featured with this post are from the auction). 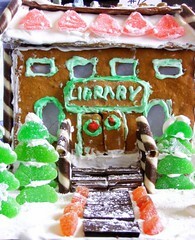 Structures that can be made out of gingerbread are only limited by your imagination. 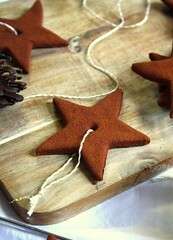 Over at verybestkids.com they give directions and a template on how to make a gingerbread sleigh. On BobVilla.com they give instructions on how to make an A-Frame, Colonial, Saltbox, and Side Gable houses. And if you really want to get inspired, on flickr.com there are over 400 photos posted to the Gingerbread House Showcase. 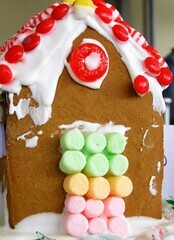 Another option to making a gingerbread house is to make a miniature graham cracker house. 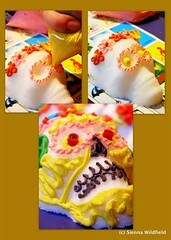 Every one in the family can make and decorate their very own. Kaboose.com offers instructions on how to make this miniature version, as does organizedchristmas.com with a few photo images. If you or your kids have allergies and want to make a gingerbread house, check out Only Sometimes Clever’s gluten-free, dairy-free, nut-free and peanut-free gingerbread house recipe, or you can buy an allergy-free gingerbread kit from kidsallergystop.com.